Toyota Camry and Corolla Among Vehicles With Lowest Recalls But What Happened With 4Runner? Toyota makes two of the 10 vehicles with the lowest recall rate. The 4Runner finds itself on a different list unfortunately for owners. The online publication iSeeCars.com has concluded a study that shows the Toyota Camry and Corolla have a very low recall rate. If you're a Toyota fan, hold the applause. The 4Runner wound up on the list of vehicles with the highest rate. The study by iSeeCars looked at the number of distinct recall campaigns from the National Highway Traffic Safety Administration’s (NHTSA) recall database as of May 1, 2018. 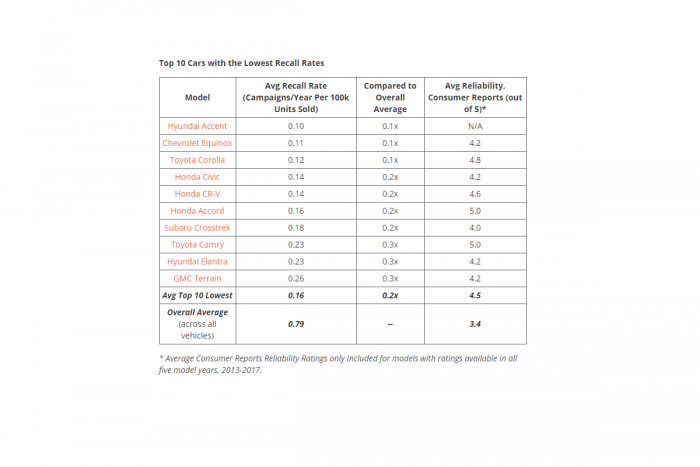 It looked at each individual model from model years 2013 - 2017 and the researchers then calculated an average recall rate (number of recall campaigns/year per 100,000 new car units sold) for each model. In other words, the ranking is not simply a list of which vehicle had the highest/lowest number of recalls overall. The overall average number of campaigns/year per 100k units sold was found to be 0.79. The Camry had a rate of about one-third of the average and the Corolla about one-tenth. The 4Runner, by contrast, had a rate two and a half times greater than average. Interestingly, in order to show some validation of the results, which many might interpret as an indicator of a vehicle's quality, iSeeCars then listed the owner-reported reliability ranking from Consumer Reports. In the case of the Camry and Corolla, both of which had nearly perfect reliability ratings by Consumer Reports, the correlation is positive. However, the 4Runner also has a perfect Consumer Reports reliability rating. Hmm. iSeeCars says of the study, "The recall rate allows consumers to compare cars based on their history of recalls. For example, comparing two SUVs between the two lists, the Chevrolet Equinox and the Dodge Durango, the Durango has a history of more frequent recalls than the Equinox." We think the 4Runner owners may find a way to discount this result, but Camry and Corolla owners will likely find it validates a key reason they chose their cars. Long-Term Quality Index - Can your vehicle beat the Camry's reliability? Check it here.